Casting on for our No-Purl Ribbed Wrap is like embarking on a little knitting vacation: lots of beauty to discovery without a lick of purling! 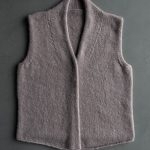 This lofty ribbed fabric alternates between just knit and slip stitches, wonderful for beginners who get a little overwhelmed juggling purl stitches and seriously relaxing for everyone else. 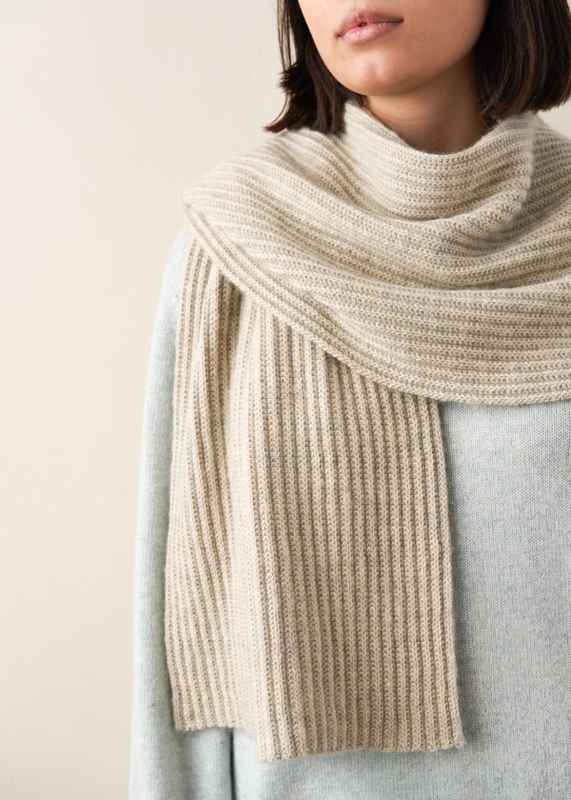 This beauty uses four skeins of our gorgeous Line Weight yarn, a pure and simple single-ply merino wool lightweight enough to serve all three scarf seasons and cozy enough to feel good anytime. And best news… Line Weight just arrived in 17 stunning new colors, from good-time Bright Flamingo to shadow-y Frond Green and everything in between. 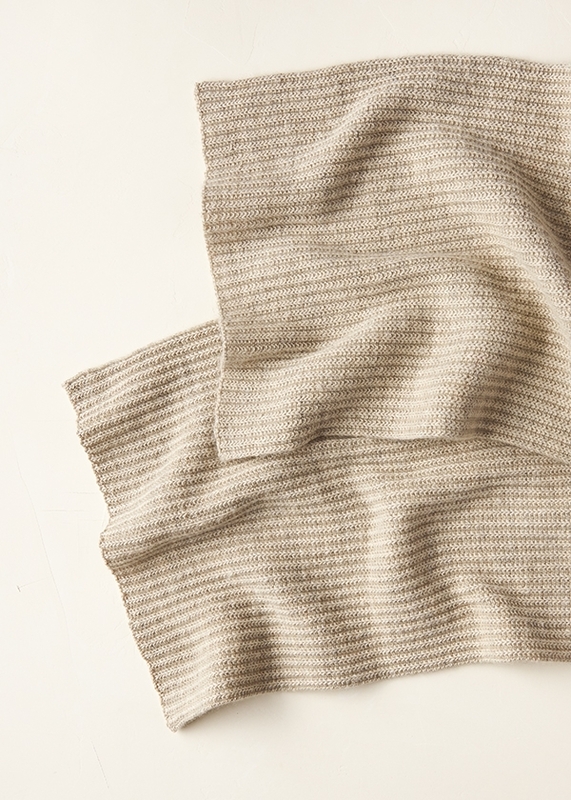 We knit up our No-Purl Ribbed Wrap in our latest obsession, Reed Gray, an oaty neutral with warmth and depth for miles… Choose the same or pick your favorite and enjoy your vacay! 4 skeins of Purl Soho’s Line Weight, 100% merino wool. Each skein is 494 yards; approximately 1,820 yards required. We used Reed Gray. This stitch pattern works over a multiple of 4 + 3 stitches. Row 1 (wrong side): K3, *slip 1 with yarn in front (wyif), k3, repeat from * to end of row. Row 2 (right side): K1, *slip 1 wyif, k3, repeat from * to last 2 stitches, slip 1 wyif, k1. Repeat Rows 1 and 2 until piece measures 70 inches from cast-on edge, ending with Row 1. Bind Off (right side): K1, *p1, slip first stitch over, [k1, slip first stitch over] 3 times, repeat from * to last 2 stitches, p1, slip first stitch over, k1, slip first stitch over. I love the ease of this stitch/pattern. I was wondering how it could be done in the round. Could I just keep repeating row 1 – or should it be row 1, close the stitches into a round and then keep doing row 2? Thanks so much. Thank you for reaching out! Knitting this pattern in the round would necessitate altering it to include purling. Because you will always be on the right side rather than alternating, your row two will need to be purls rather than knits and for the slips the yarn will need to be in the back rather than the front. I hope this helps and happy kitting! Hello Joyce, thank you for reaching out! I think this pattern would be beautiful in our Cattail Silk. We love using it for light weight wraps! I’d like to do this with another number of stit ches. Is it a multiple of 4 plus 1, or ? Thank you for reaching out! This stitch pattern works over a multiple of 4 + 3 stitches. Thanks for reaching out! It is hard to say without seeing the pattern, but this looks like the “(k1 and yo)” is explaining which stitches to pass over and is not in addition to. 1. so you will bring the yarn in front and then essentially wrap it around the front of the slip stitch so that you can continue to use the knit stitch? that is brilliant. 2. 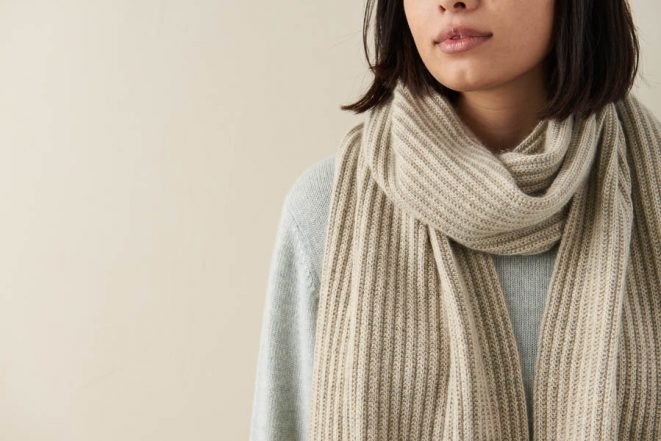 Opinion on if this scarf would look good worked horizontally instead of vertically – kind of like the ticking stripe wrap? I was thinking I could cast on 427 stitches and work it that way for a different look and add different colors of the line weight for long stripes of color. Thanks so much for the kind words and for writing in! Yes, you will bring your yarn to the front of the work for each slipped stitch and return it to the back for the knit stitches to mimic the look of ribbing without ever purling! 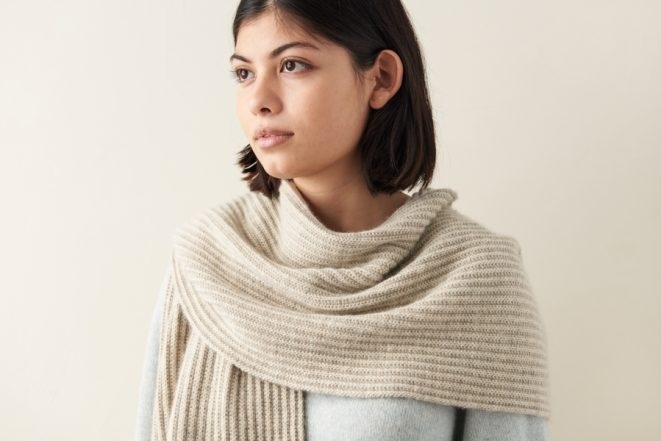 I also think this would be a great option for a striped scarf that is cast on at the long edge instead of the short edge – if you give it a try, please do let us know how it turns out! Good morning! Can you tell me if so can knit this in cotton pure? Would I have to adjust the cast on stitches or needle size? 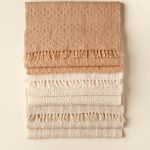 Also, when will all the colors of cotton pure be back in stock??? Thanks for reaching out! I think Cotton Pure would be a wonderful yarn to use for this wrap! Since it is a thicker yarn than Line Weight, you will want to increase the needle size to a US 6 and knit a gauge swatch in pattern to determine how many stitches to cast on. At this time we are expecting a new shipment of Cotton Pure some time this summer; however, we have moved our production to a new mill, and although it is being made to the same specifications as our original Cotton Pure, the color range will be different. We are very excited for the reworked yarn to arrive, so please keep any eye out for an announcement later this year! Can this pattern be used with a larger size needle and if so what yarn. Great question! You can certainly knit this stitch pattern up in just about any weight of yarn! I would suggest choosing a needle size that is on the larger end of what is recommended – for instance, our Worsted Twist calls for a US 7 to 8 needle, so I would suggest knitting a gauge swatch in pattern on a US 8 or 9 to see which needle size gives you a fabric you are happy with. Love the simplicity of this pattern with a classic result! 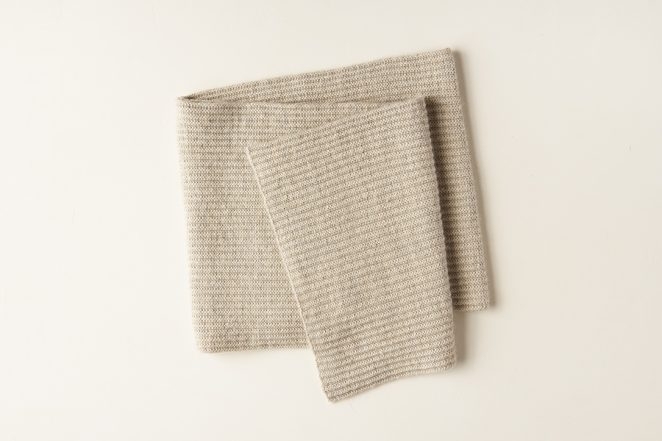 Thinking about a gray scarf and looking for a cool gray vs. a warm one. Is cinder gray cooler than dove gray? Or is there another cool gray you recommend? Many thanks! Thanks for reaching out! Yes, Cinder Gray definitely leans more towards cool tones than Dove Gray! It is quite a bit darker than the colors you chose, but Fieldstone Gray also would make a lovely cool gray wrap. Thanks for reaching out! You will increase the cast on number by multiples of four, and then add 3 stitches to that number. For instance, you could increase it to 183 stitches because 180 is a multiple of four, plus 3 extra stitches. Thanks for reaching out! Unfortunately we do not have a video for this technique, but it’s quite simple! When you come to a slip 1 wyif, you will bring your working yarn forward between the needles as if you were going to purl, slip the next stitch purlwise without working it, and then return your yarn to the back of the work in order to knit the next stitch. I would like to knit this wrap . 147 stitches – is this for length or width? Thanks so much for the kind words! 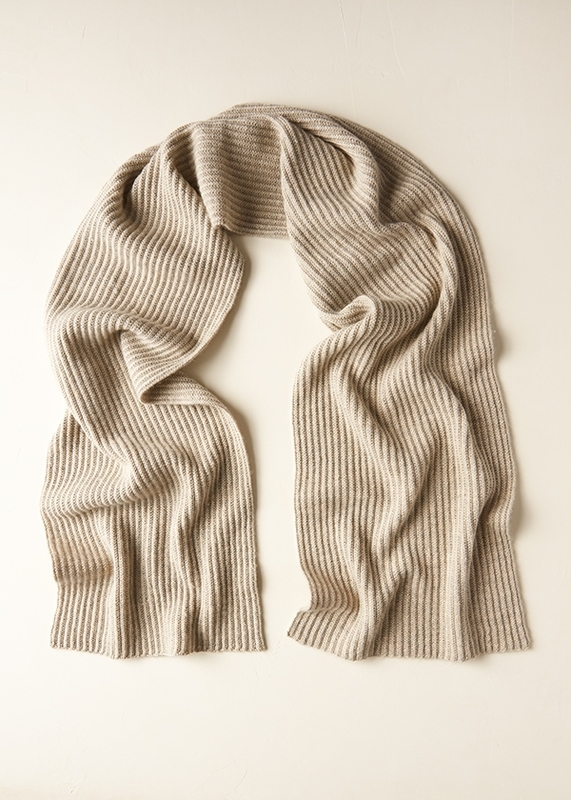 You will be casting 147 stitches to make the width of the scarf, which is 13 1/4 inches. 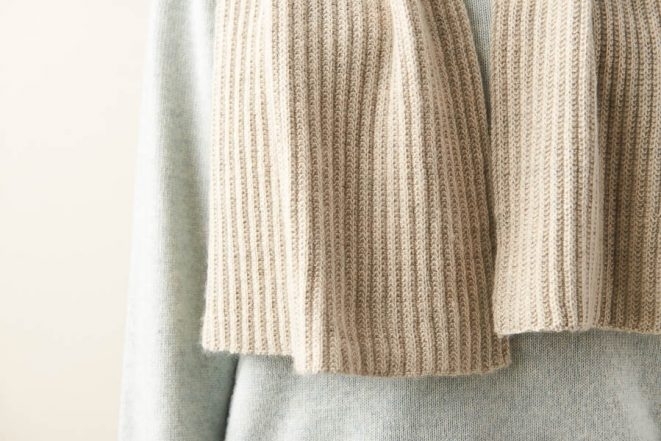 Can this pattern be knit in a heavier weight yarn, e.g., worsted, and still get a lofty look? Great question! While this pattern looks lovely in a worsted or aran weight yarn, much of the lofty look of this version is due to the feather-light nature of Line Weight. 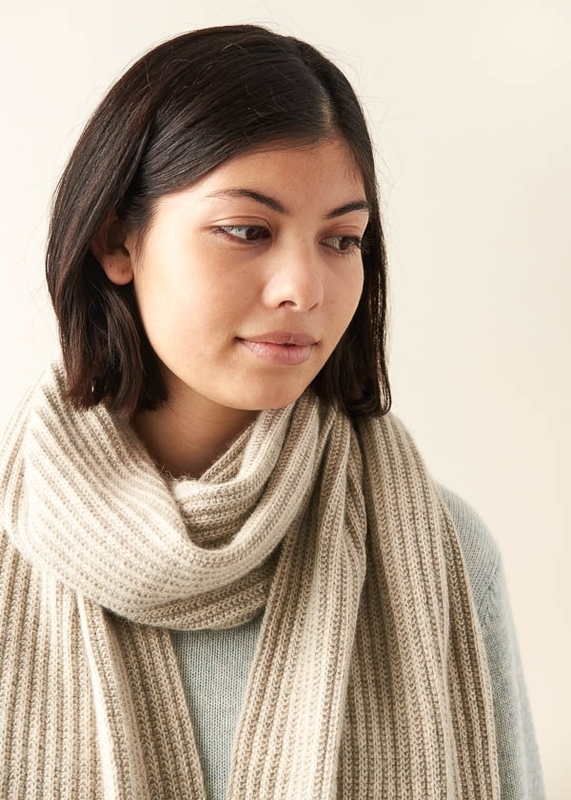 Our original No-Purl Ribbed Scarf is worked in aran weight Alpaca Pure, and as you can see, it has a very cozy, hearty appearance. Would this pattern work with your linen quill yarn? Thank you! Thanks for reaching out! 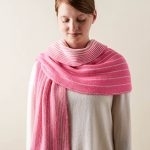 Yes, Linen Quill knits up to the same gauge as Line Weight, so it is an excellent substitute for this wrap! 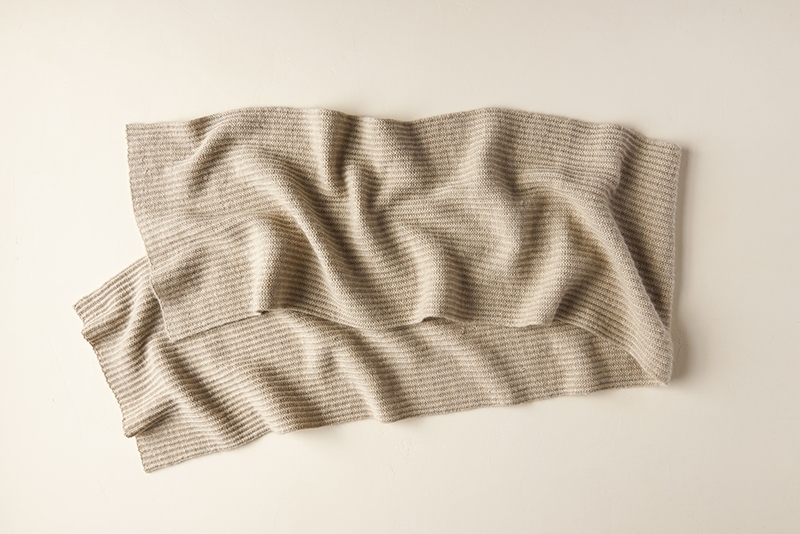 This scarf looks like it lies flat and drapes easily. But does it have a tendency to curl, on either the sides or at the bottom? Thank you for this question! As long as your gauge isn’t to tight you shouldn’t have a problem with curling. If you do have curling it will be minimal and will be eliminated with blocking. I’ve been working on a gauge swatch and have been confused. I’m a beginner at knitting so there’s probably a simple answer. I keep ending up with an extra stitch at the end of each row. The directions for the gauge are for 44 stitches and 60 rows. Should I have cast on 43 or 47 stitches to get the pattern to come out correctly? Thanks! Thanks for writing in! This stitch pattern is worked over a multiple of 4 plus 3 stitches, so your cast on for the gauge swatch will also need to be a multiple of 4 plus 3 stitches. ecause you will always get a more accurate gauge measurement by knitting your swatch a little larger than indicated, I would suggest casting on 51 stitches. The pattern says Gauge “44 stitches and 60 rows = 4 inches in stitch pattern” For my gauge swatch, do I knit in the 2 row pattern? If yes, how many stitches do you recommend I cast on? I’m new to knitting gauges swatches, so this might be a basic question?! Thanks for reaching out! Since the gauge measurement indicates it is “in stitch pattern,” yes, you should knit your gauge swatch in the No-Purl Rib pattern. This stitch pattern is worked over a multiple of 4 plus 3 stitches, so because you will always get a more accurate gauge measurement by knitting your swatch a little larger than indicated, I would suggest casting on 51 stitches. My shawl using the yarn called for in the pattern is coming out wider than 13 1/4inches casting on 147 stitches. Should I change needle size or cast on less stitches? Thank you for writing! This is up to you- it sounds like your gauge is to large so to get the correct gauge you should go down in needle size. This will also tighten up your stitches, so if you are liking the tension you are getting with the larger gauge you can cast on less stitches. You will just want to be sure that your cast on is a multiple of 4 + 3. Is the suggested gauge based on washing the swatch or just knitting the swatch without washing? Thanks! Thank you for this great question! 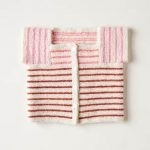 The swatch that we knit up is unblocked. What an elegant pattern! Reminds me of dornik herringbone. The pattern is easy to memorize & knit – which makes this a good project to take along on my travels. Scarf in progress is as beautiful on the back as on the front. My one minor concern is that four skeins will produce 70”. I’m using the beautifully soft Line Weight; at 10” so far, I don’t think the first skein will get me a quarter of the way toward 70”. Thank you for a well designed pattern and exquisite yarn! Thank you for reaching out and for your kind words! Our sample is 13¼ inches wide x 75 inches long and weighs approximately 335 grams so there should be plenty of yarn to complete this project. Could your row gauge be off? We got 60 rows per 4 inches in stitch pattern.